Most stinging caterpillars belong to the insect family known as flannel moths. Flannel moths get their name from the flannel-like appearance of the wings of the adult, which are clothed with loose scales mixed with long hairs. The immature stages of flannel moths are caterpillars which are clothed with fine hairs and venomous spines. The spines, when brushed against the skin, produce a painful rash or sting. The best known flannel moth and stinging caterpillar in Texas is the southern flannel moth, or puss moth caterpillar, Megalopyge opercularis. In Texas these caterpillars are commonly known as “asps”. This caterpillar is often abundant and may infest shade trees and shrubbery around homes, schools, and in parks. They are of minor importance as enemies of shade trees, but they can cause a severe sting. When a puss moth caterpillar rubs or is pressed against skin, venomous hairs stick into the skin causing a severe burning sensation and rash. Southern flannel moth caterpillars are teardrop-shaped, and, with their long, silky hairs, resemble a tuft of cotton or fur. Their color varies from yellow or gray to reddish-brown, or a mixture of colors. The mature larva is 1 to 1 1/2 inches long with seven pairs of prolegs (suction-cup like claspers, on the rear half of the body). The adult moth has blunt wings covered with long, wavy hair and a wingspan of 1 to 1 1/2 inches. Wings are orange at the base, fading to cream-colored at the tips, and the legs are covered with delicate, strikingly colored hairs. Other common stinging caterpillars in Texas include the Io moth, buck moth and saddleback moth caterpillars. Adult moth of the Southern flannel moth, Megalopyge opercularis, Photo by Laura Bellmore. Adult puss moths emerge in late spring or early summer to lay several hundred eggs on favored host trees, such as oaks, pecan, elm, hackberry and other trees. Caterpillars may also be seen feeding on dwarf yaupon and other shrubs. 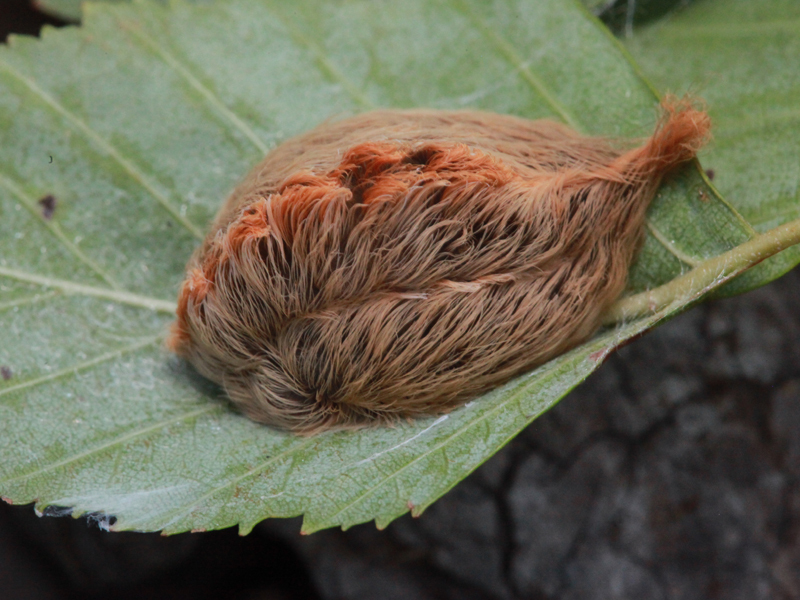 One to two generations occur each year, though southern flannel moth caterpillars tend to be more common in the fall. The caterpillar spends the winter within a unique-shaped cocoon. Cocoons can be found on the trunk or branches of the host plant. At one end of the cocoon a trap door is provided for the escape of the adult as it emerges from the pupal case. The dorsal surface of the cocoon is marked by a structure similar to a leaf scar. The color is about the same as that of the larva, because the larval hairs are incorporated in the silk. Puss moth caterpillars rarely cause serious damage to trees; however they can pose a health hazard to children and gardeners. Intense, throbbing pain develops immediately or within five minutes of contact with the caterpillar. Stings on the arm may also result in pain in the axillary (armpit) region. Erythematous (blood-colored) spots may appear at the site of the sting. Other symptoms include headaches, nausea, vomiting, lymphadenopathy, lymphadenitis, and sometimes shock or respiratory stress. 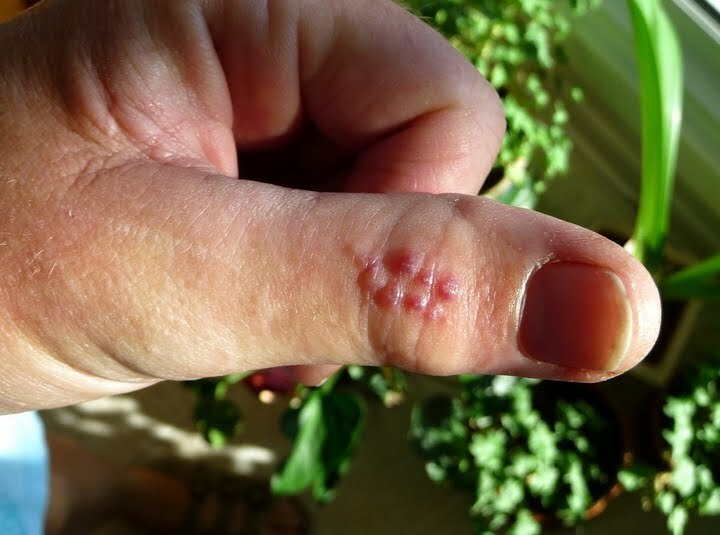 Pain usually subsides within an hour and spots disappear in a day or so. An ice pack should be applied to the site of the sting, and oral antihistamines can be administered to help relieve the itching and burning sensations. For caterpillars with stout spines (such Io moth and saddleback caterpillar), try carefully applying cellophane tape to, and stripping it from, the sting site. This helps remove the irritating spines. For allergic reactions, such as generalized itching or difficulty breathing, see a physician immediately. For severe pain physicians sometimes administer meperidine HCl, morphine, or codeine; aspirin is reportedly not effective. Eye injuries should also be referred to a specialist immediately. Puss moth caterpillars can be controlled when they become abundant by spraying with a residual pesticide such as permethrin, cyfluthrin or similar sprays labeled for control of caterpillars on ornamental plants. In some cases, such as on school playgrounds, the best solution may be educating students and teachers on what the caterpillars are, and the importance of not touching with bare hands. First aid information in this publication is based on recommendations published in the Physician’s Guide to Arthropods of Medical Importance (Jerome Goddard, 1996, CRC Press, 2nd Ed.). For more information on stinging caterpillars request publication L-1312, Stinging Caterpillars, from your local county Extension office. These publications, and help with additional questions about asps or other pest problems, can be obtained by contacting your county Extension office.